This week's movie inspired Drunken Stampers challenge is Braveheart. One of my all time favourite movies...must be my Scottish heritage. Be sure to visit the DRUNKEN STAMPERS BLOG for all the details on this challenge and to see all the great projects our May guest designer Diane and the Bahama Mamas have whipped up this week. You can use either use the movie Braveheart as your inspiration, or tartan / plaid / gingham. 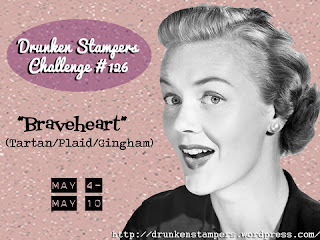 Be sure to upload your project to the Drunken Stampers blog by 11:59 pm PST on May 10th. For this challenge I decided to make a tag. I started with a kraft tag and used Tim Holtz distress stains to create my own tartan background, if I do say so myself I am pretty pleased with how it came out. I added a piece of Tim Holtz filmstrip ribbon down the left hand side of the tag and added some elements that reminded me of the movie and / or Scotland. I coloured the chipboard crown and key with black soot distress stain and added some bling. The thistle inside the bottlecap came from a set of embellishments I bought after my trip to Scotland last year. The cog flourishes are from this month's SCRAPTURES card kit (Hot Off the Press Steampunk Stickers). Happy crafting & thanks for visiting!! 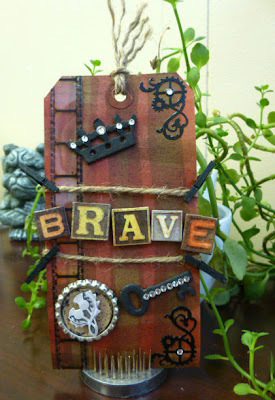 Beautiful tag, love the background you created! Awesome job on the tag. fab. job on the plaid background. I don't share the same excitement over the TH stuff but that's because I don't know how to use it. Holy Crow Donna! Your tag is fabulous! You are a wizard with all things TH!